Editorial: Scientific temper - Jacob Ninan says a scientific temper is not incompatible with true faith. One short life - Samuel Manoharam presents the biblical perspective on life for a child of God. Offering obedience - Do we Christians measure up to the biblical standard of obedience? asks Susan Ann Samuel. Why we need god’s power - Joshua J. Kollanoor explains why we need God’s power. The basics of basileia - Suresh Manoharan explains the basics of God’s kingdom. God, our goal and gossip - Our goal should be to follow Christ, not people, points out Tabbsum Paes. Cain's way - The weapons God has given us to fight the devil are not the weapons of this world, reminds J. Fredric Dawson. 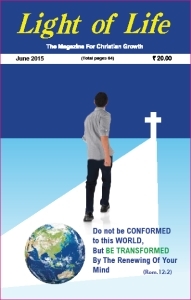 Males in covenant - Kuruvilla Chandy emphasises that obeying God is all a matter of keeping covenant with Him. Little compromises - Let's not offer ourselves as sitting ducks to the Devil, warns Jacob Ninan. Your Questions Answered - Rejoice always Sandeep Poonen.